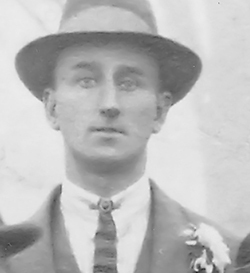 Peter Gandy, the son of Henry Gandy and Beatrice Matilda née Ireland, was born on 4 April 1896 in Fretherne. His father was a coachman at Fretherne Court. By 1911 Henry had retired and the family were living on The Green, Frampton, with Peter employed as a hall boy, perhaps also in service to the Darell family. He subsequently moved to Kensington where he worked as a footman. Peter enlisted on 4 February 1915 at Chelsea Town Hall, being posted to the 17th (Service) Battalion (Football), Middlesex Regiment as a private. The core of the battalion was a group of professional footballers from which it derived its name. By 17 November he was serving in France as part of the 6th Brigade where he led an 'interesting' life. He was treated for short bouts of illness (scabies and trench fever), court-martialled for sleeping on sentry duty (being sentenced to 84 days Field Punishment), and he received a bullet wound in the neck on 1 June 1916, for which he was treated at hospital in Rouen before rejoining his battalion on 19 June. On 31 July he was again shot, this time in the left arm, and was repatriated from 2 August to 31 December. On recovery he was posted back to France to join the 19th (Service) Battalion (2nd Public Works Pioneers) of his regiment. Peter Gandy's luck still held. He was again shot in the arm on 13 April, but it was a slight wound and he remained in the field. In September he was awarded extra pay of 6d. per day, which may have rewarded his specialist military qualifications of Stretcher Bearer and 1st Class Shot. On 15 November he was transferred, probably with his battalion, to Italy, where he served until 3 March 1918. Back in France, in mid-June, Peter came down with influenza. After convalescing at Boulogne he was sent to the UK on leave from 16 to 30 August. However, he was only a few weeks back in action before, on 9 October, he was gassed, for which he was treated in hospital at Boulogne. Peter did not rejoin his unit until 29 October, shortly before the Armistice. He returned to the UK on 30 March 1919 and was demobilised on 30 April. Peter was awarded the 1914-15 Star, British War Medal and Victory Medal and his service is commemorated on the plaque in the village hall. After the war Peter returned to live with his parents in Frampton. He drove for Cadbury's, collecting milk from the farms and was also a special constable for a while. His later years were spent at 10 The Oval with Mervyn and Monica Davis. Peter Gandy's death was registered in the Gloucester district during the spring of 1982.